You don't have to get on a ferry boat to the Greek islands to enjoy swimming in the Aegean Sea. Athens has a string of beaches which begins in Pireaus, known as The Apollo Coast and like any city the further you get out of town the better the beaches are. While there are people who do swim in Pireaus and Faliron, I don't, (though it probably won't kill you, at least not right away). This does not mean that I wouldn't if it was a really hot day and I did not have the energy to get further out. I have been swimming in worse places than the city beaches of Athens and I have lived to tell about it though I was too young to know any better. 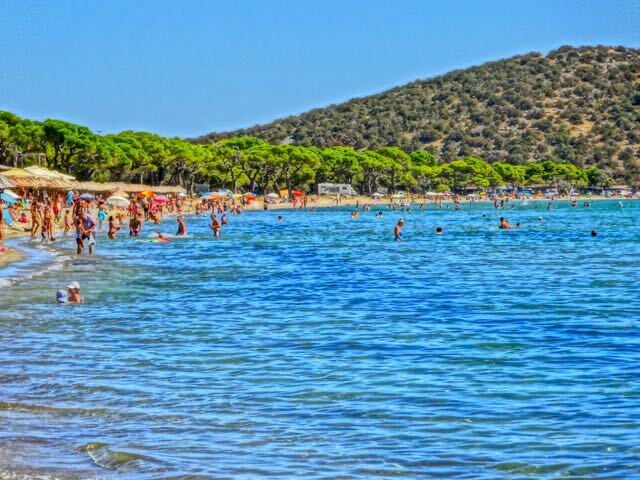 But in general if you want to play it safe and enjoy the best beaches Athens has to offer you should begin with the Kavouri-Vouliagmeni area and find the beach most suited to you between there and Sounion. But honestly the seas close to Athens have become a lot cleaner and if you happen to be staying in Faliron or even in Pireaus there is no reason not to go for a swim. Just don't swim in the harbor. Not just because it is dirty but you don't want to get run over by a ferry. The best thing about staying in Pireaus, Faliron, Kalamaki, Glyfada and Voula is that you have a number of easy options for getting into Athens which is between 15 minutes and half an hour by bus, tram, metro or taxi or a combination. If you want to stay in a hotel convenient to Athens but still on the beach then probably a resort hotel like the Divani Apollo Palace or the Astir Palace Hotel are good choices and just an hour from the city. They are expensive but it is almost like being on an island except you are so close to Athens that you can see it. There are other hotels in the area of varying prices and quality, most of them across the street from the beaches in suburban neighborhoods which is a good thing because you have easy access to shops and restaurants. For those who want to go all out, another 15 minutes by car is the Grand Resort Lagonissi with the Sunset Suites costing about 2774 euros a night, though a normal Deluxe room with a view of the bay a mere 312 euros a night. But if you stay here you have already saved the cost of the ferry to an island. See Athens Coast Hotels for many more choices. 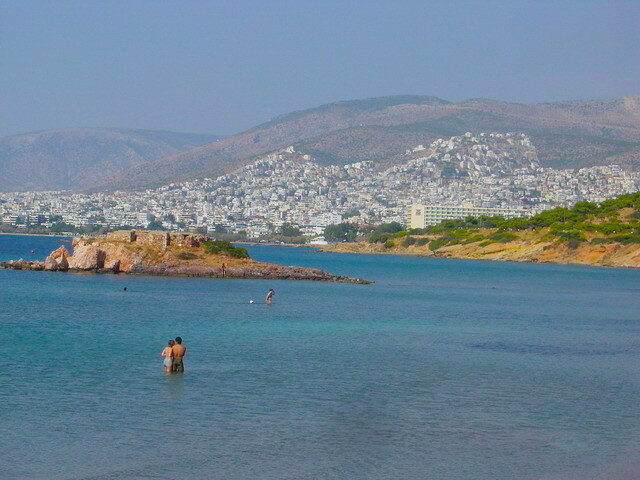 Athens has several very nice pay beaches on its southwest coast, starting at Glyfada and ending in Varkiza. These beaches have cabanas, snack bars, showers, cafes, restaurants and everything you need to not be bored at the beach. Between the very popular pay beach of Vouliagmeni and the next town which is Varkiza, are The Coves where you park your car at the top and walk down to some small pebble beaches and flat rocks, which are like finding somewhere remote on an island, except for the hundreds of young people who come on weekends and in the summer because it is free, pretty clean, great for snorkling and because some people just don't like sand. But if you come on a nice weekday in the off-season, which is anytime that is not July or August you should have a cove to yourself if you like, or at least a flat rock or two. Depending on the wind and other variables some beaches are popular with wind-surfers, mostly between Saronida and Anavissos. 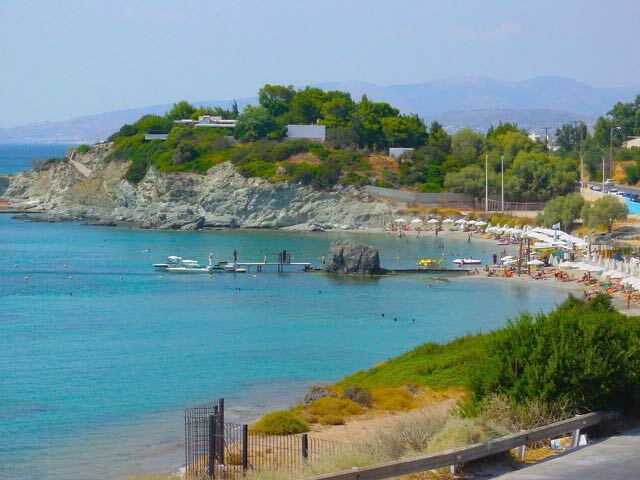 Anavissos has a long open beach and lots of fish tavernas and is a favorite place for Athenians during the weekends and especially on Sunday. 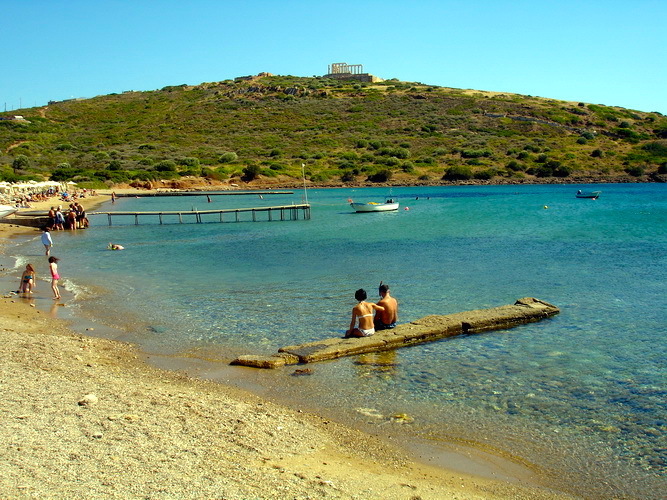 There are a few small scattered beaches between Anavissos and Sounion. In Sounion there is a small beach below the temple with two tavernas and the Aegeon Beach Hotel, another alternative to going to the islands. What more could you want? A beach, ancient temple and 2 tavernas. Between Sounion and Lavrion are a number of tiny coves and beaches but the problem is finding them. If you have a car you will see signs but if you have come on the KTEL bus forget it. Stick with Sounion or any beach you pass on the way there that looks nice to you. The adventurous can continue on to Daskalio which has a few nice little fish tavernas close to two sandy beach coves though you will need a car to go here. I usually go straight from the airport when I arrive in Greece, rather then straight into Athens, to get my Aegean Sea fix and a nice meal. George the Famous Taxi Driver picks me up at the airport and I ask him to bring a towel for me (no charge). The best restaurant is Litsa's which is in the small port near the beach, and also Kosta's a few steps away. There are some tavernas closer to the beach as well but i have not eaten at them. Daskalio is more easily reached from Athens if you take the Attiki Odos (National Road of Attika) and go past Markopoulo and look for the signs when you get to Keratea that will lead off to the left. 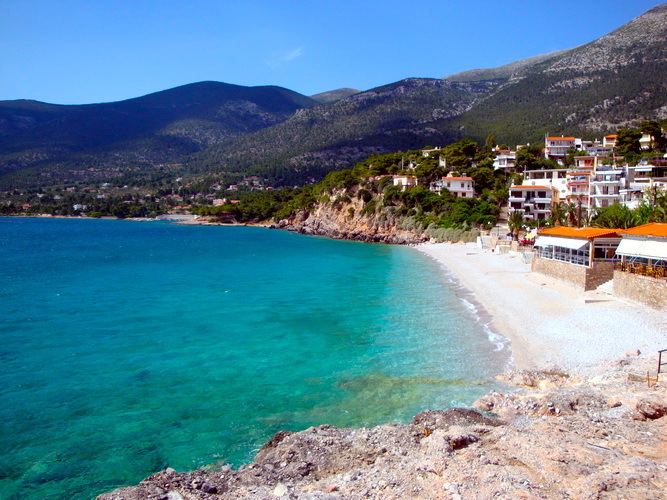 There is also a beach at Kakis Thalassa, a little further on. The beaches at Avlaki, Porto Rafti, Loutsa and Rafina, all pretty well built up now and surrounded by apartment buildings and summer houses, all the way to the beaches of Nea Makri. But the long beach at Schinias is one of the nicest in Greece and looks more like something you would see in Halkidiki than what you would expect to find this close to Athens. It is a long sandy beach that faces south and there is a large pine forest that goes to just a few feet of the sea so there is plenty of shade to park your car, have a picnic, or pitch a tent (you can't stay overnight). 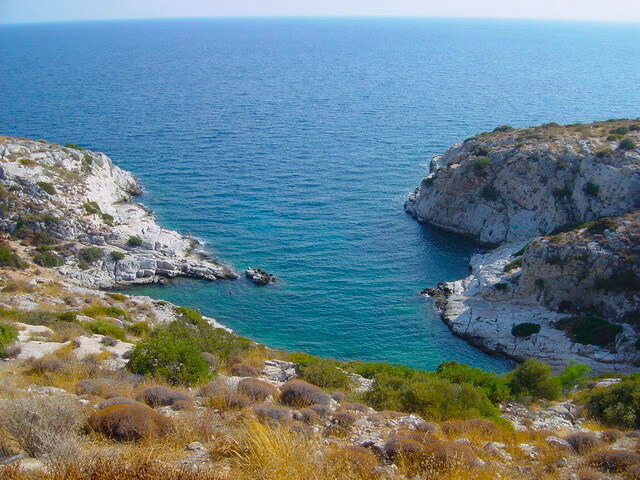 There are also several fish tavernas on the beach and some fish and meat tavernas inland on the road. It can get very busy in July and August but it is a very long beach. There are plenty of beaches beyond Schinias as you work your way north up the coast and the further you get the more it will seem like a Greek island to you. There is a small cove and beach at Agia Marina near Ancient Ramnous where you can even take the small ferry to Styrra in Evia. You can continue going north to beaches at Agios Dimitrios, Kalamou and go all the way to Oropos where you can take the ferry to Eretria, also in Evia. But as long as you are doing all this driving I suggest a drive to Porto Germanos which has an amazing beach on the Corinthian Gulf that really feels like you are on a Greek island. You can get here by KTEL bus or by driving to Elefsina and turning off at the road to Thebes. The ancient city of Egosthena is there too, one of the most impressive archaeological sites that you have most likely never heard of. 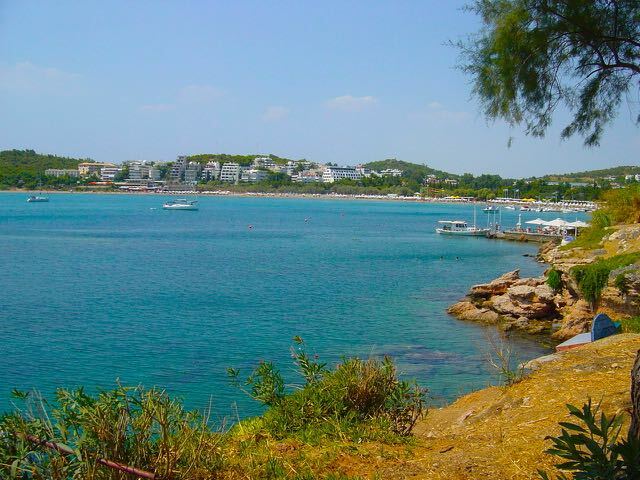 As I mentioned previously pay beaches like Vouliagmeni, run by EOT, (Greece's National Tourist Organization) charge admission and offer changing cabins, self-service restaurants, tennis courts, basket-ball and volleyball pitches, children�s playgrounds, canoes and pedal canoes for hire. 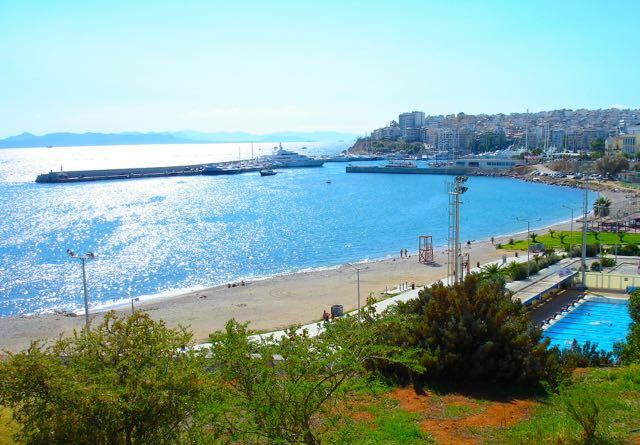 Other public beaches run by EOT are in Paleo Faliro, Alimos, Glyfada, Voula, Varkiza, Alcyoni, and Lagonissi and I believe Avlaki. The best way to go to the beaches of Attika are by car, either a rental or get together with some friends and book a taxi for the day. As for public transportation the Coastal Tram goes as far as Voula. From there you can take the 122 which goes along the coast as far as Saronida. A faster way is to take the metro to Ellinikon and catch the 122 there. The yellow Attika buses leave from Areos Park, (near Platia Egyptos where Alexandras Ave meets 28-October Patission Street) and will take you to Agia Marina, Anavissos, Lagonissi, Sounion and Lavrion as well as to the beaches on the other side of Attika like Rafina, Porto Rafti, Marathon, Schinias and Oropos. You can also take the metro to Glyfada and take a taxi or a local bus from there to one of the beaches. If all this sounds like too much you can always get on the metro to Pireaus, get on a ferry and be in Aegina or Angistri in about an hour. These photos below are mostly from a trip I took to Lavrion to catch the ferry to Kea with my friend Christos, who works with George the Famous Taxi Driver. Christos is an avid diver and sea person and we had plenty of time before the boat left so he showed me just about every beach on the way. If you are going to be in Athens and want to do some snorkling you can contact George and you can make an afternoon of it. In fact there is no reason to limit yourself to Attika because there are great places to dive within a couple hours of Athens by car. In the meantime these are the photos I took with him.Just click on the photos to see them full size with my comments.